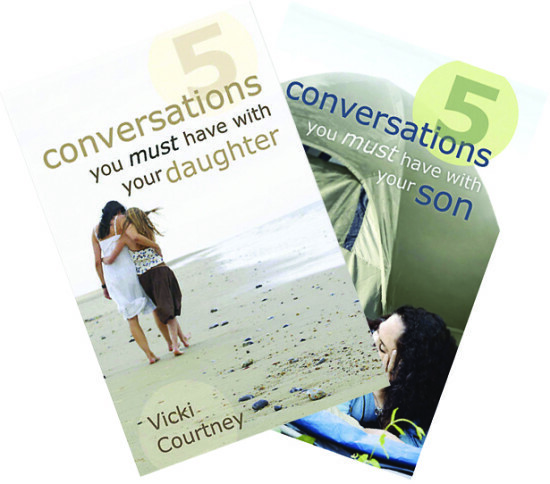 Some of you are here as a result of reading one of my books, 5 Conversations You Must Have With Your Daughter or 5 Conversations You Must Have With Your Son and others may be here as a result of going through a 5 Conversations Bible study in your church or a neighborhood small group. Regardless of how you got here, I’m honored you stopped by the 5 Conversations Blog! This blog is pretty easy to navigate. Depending on which book or study you are doing, click on either the “Moms of Daughters” or “Moms of Sons” link to find the bonus material I mention in the books. And don’t be shy! I would love to hear your suggestions while you’re here, so feel free to comment on any of the “conversations” and share your wisdom. When 5 Conversations You Must Have With Your Daughter released in early fall of 2008, I had just moved my only daughter off to college. Weird timing, huh? Especially given the fact that the tagline on the back cover of the book says: “From the cradle to college…Telling your daughter the truth about life before she believes the culture’s lies.” And as if the timing couldn’t get any more ironic, the release of 5 Conversations You Must Have With Your Son in summer of 2011, came within days of my oldest son’s wedding and my youngest son’s graduation from high school. Stop the clock! I know you hear it all the time, but time flies. Take it from a mom who has officially launched all three kids from the cradle … to college. A mom who sometimes wishes her house wasn’t quite so quiet and clean. So, bravo to you for making the most of the years while your little ones (and bigger ones!) are still in the nest. Your investment will not return void. Before you know it, you will be the one packing up the car to move your child into their dorm or sitting on a front pew, dabbing your eyes as they exchange their vows. Well, enough about me and my kiddos — I would love to know a little bit about you and the son or daughter that inspired you to pick up the 5 Conversations book or study. Please comment below with your name and your sons’ or daughters’ first names, ages, and your home state and I would consider it a privilege to pray for you.